THIS OR THAT: Mike Solomon pieces both watercolor on paper infused onto resin. And the winner was: NEITHER. We collectively decided the pieces were TOO strong for the space given what was happening in the (un-pictured) living room. Plan C for the wall also looked washed out on the back in style beige wall, so the search continues. NO WORRIES. There were other unexpected wins. Like this Raymond Hendler in the bedroom. Our client had some Outsider Art textile pieces earmarked for here., but me awkwardly holding up the Hendler changed that plan. The textiles are now going in the dressing room (how appropriate), and the Hendler "smile" has a new home. Suddenly the existing wood sculpture was underwhelming so YAY, another win. I honestly had no great ideas for the dining nook going into this day. We had some smaller works in the mix, but the client wanted an abstract food-themed piece and I had not sourced one yet. So we put some smaller ones up just to see them. My favorite that I thought wouldn't stand out enough actually looked beautiful, delicate, and appropriately scaled. The client vetoed that one though and is leaning towards another that currently lives in a frame too awful to share. We're doing a frame exchange (that almost rhymes) next week so the jury is still out on this one. Our fave but our client’s veto. And finally, the quilt we were going to replace with 4 Sam Messenger drawings actually looks GREAT with one of the drawings... so yes, I save people money left and right and THIS is a fun combo. We did have to remove the heinous acrylic frame and are replacing with a white washed maple, BUT the combo works surprisingly well together. Fun combo for the WIN. And finally finally, the FKA "Definite" before the in-house viewing is heading back to the gallery. It's SUCH a beautiful piece but the colors and light weren't doing it justice so back it goes. 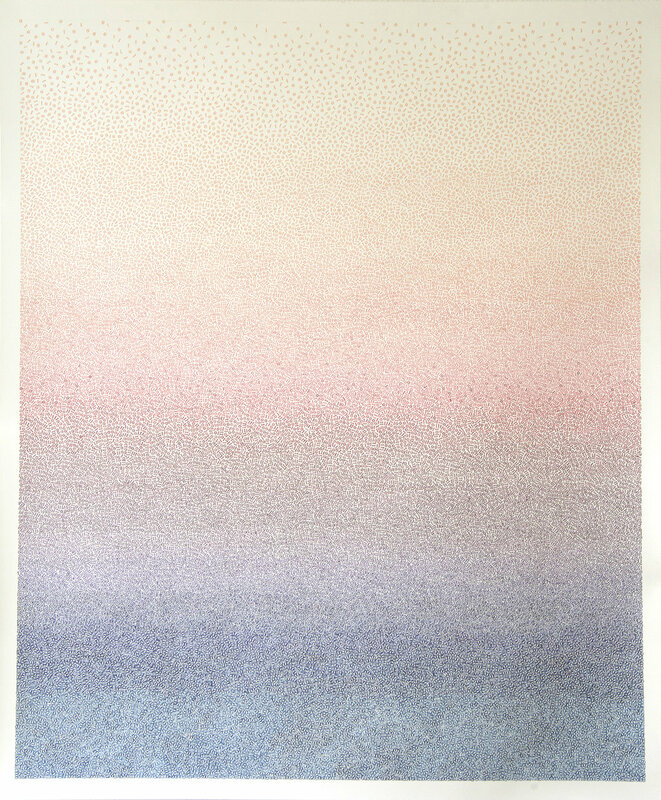 Nicky Broekhuysen’s Sunset work, made of hand stamped 1s and 0s that touch but never overlap. NOTE that getting stuff on approval, while amazing, doesn't happen every day. Galleries and artists have their own policies for sending art out on approval (some do it, some don't, some charge, some don't), and it takes a lot of time, some risk (don't spill on art that's not yours), and costs are involved in terms of administering the transport, insurance, and other logistics. BUT, when it works it WORKS.